Hacker news at your fingertips. Is there a better alternative to Hacker Bar? Is Hacker Bar really the best app in Newsreaders category? Will Hacker Bar work good on macOS 10.13.4? Hacker Bar lives in your menu bar and provides a steady stream of the top news stories from Y Combinator. This Open-Source utility lets you quickly and discretely check hacker news. Grabs the top stories from Y Combinator and seamlessly refreshes them every 5 minutes (or at a customized time interval). Puts a check mark beside each viewed story. Never again wonder if a link has been visited and use this feature to quickly jump back to any interesting article. 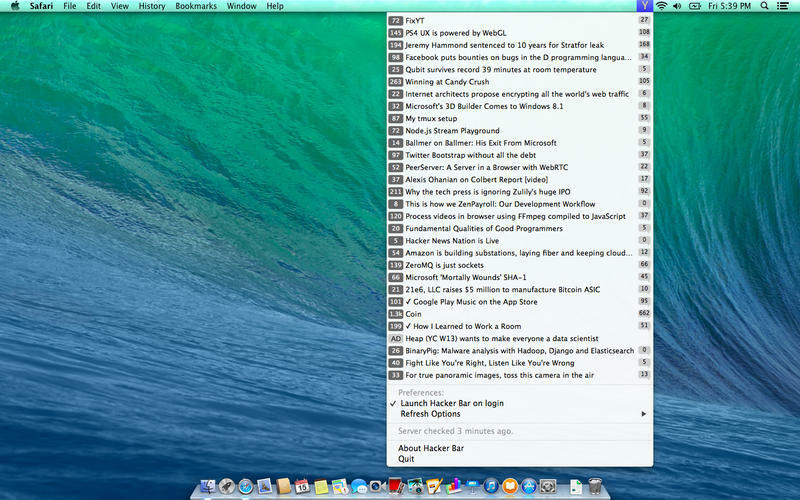 Support for OS X 10.10 Yosemite "Dark Mode"
Speed improvements and other misc fixes. Allows multiple stories to open in a new tab by group linking articles. 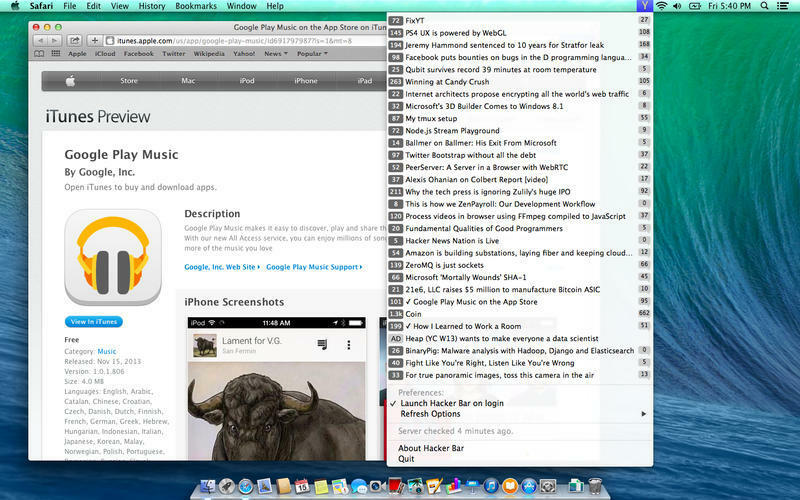 If the web browser is open and the active application, stories will open in the background without closing the Hacker Bar menu. Gives easy access to comments with a click of the comment count bubble. Here, registered users can up-vote articles and get flame wars started even faster! Can be set to auto start on login, never missing another great Y Combinator story!